Jumprava is a Latvian Synth-Pop / rock band from Rīga, Latvia that is extremely popular within the local audience. 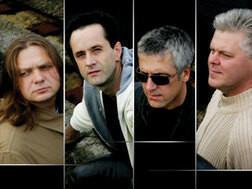 Their songs are mostly written in Latvian, which is one of the main reasons why they have remained as only a local band. Still, their music has always been rather different from the other popular bands in Latvia, and some have called them "the Latvian Depeche Mode". Their songs are very melodic and can be characterized as Synth-Pop and Rock.